Today is National Hairball Awareness Day. For cat lovers and owners, you’ve likely had to deal with a hairball or two in your (cat’s) lifetime. If you’re lucky, you catch the familiar hacking sound and are aware of the regurgitation instead of stepping in it in the middle of the night. 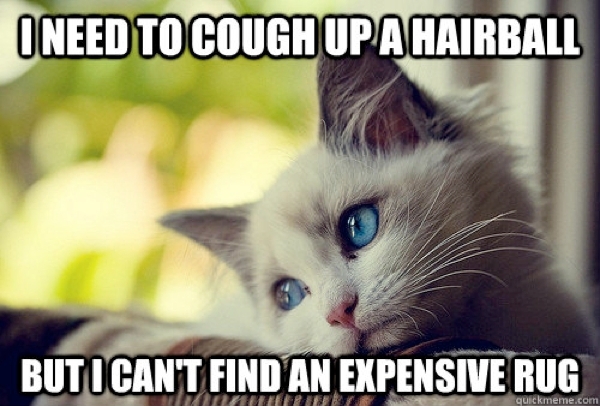 (admit it, it’s happened to you too) But what is a hairball? Why does it happen? What can you do to help stop it? And did you know there is a SONG about hairballs too? 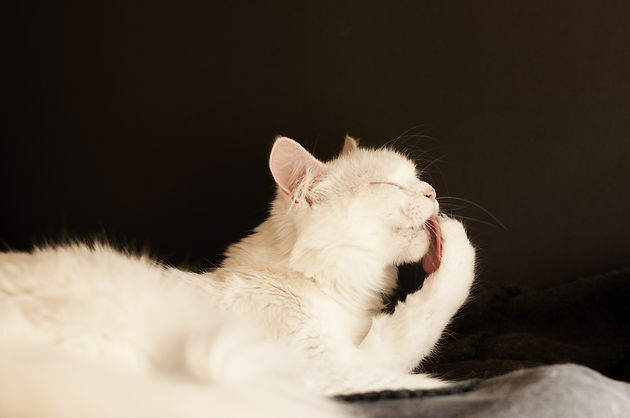 As you know cats groom themselves, bathing themselves with that scratchy tongue of theirs. They ingest the loose hair though, and that builds up in the stomach and forms…the dreaded hairball! What can you do to help stop hairballs? Brush your cat often! You will gather loose hair in the brush (pull the hair out of the brush and throw the hair away) and your cat will likely be in 7th Heaven while you do it too! Ask your vet for help! 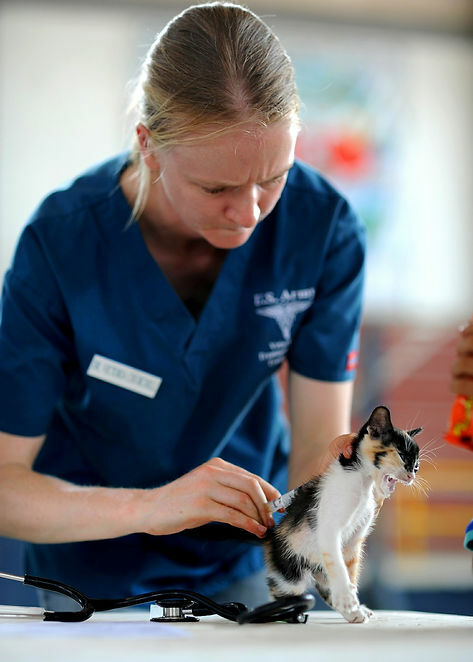 Your vet may be able to recommend a hairball lubricant or a food formulated to reduce hairballs. Supplement cat’s food with pumpkin! 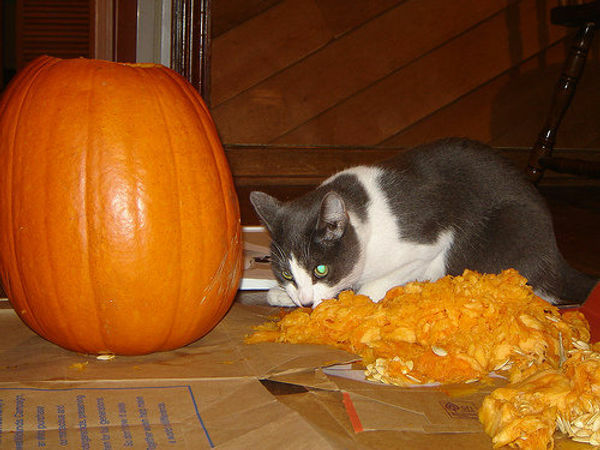 (your reaction is probably like mine was when I first read this tip on Meowingtons.com) They recommend mixing a couple teaspoons of canned pumpkin in your cat’s food a couple times a week! Check with your vet first though. And what about that song about hairballs? Thanks to Catster.com for this one:"(sung to the tune of “Memory” from Cats)Hairballs, he threw up a big hairballIt’s all over the sofa It’s all over the chair I remember a time when I could sit anywhere Now, with hairballs, that is rare Hairballs, you can tell when they’re comingYour poor cats starts upchuckingAnd he runs here and thereI remember a time when I could walk with feet bareNow with hairballs, I don’t dare Chorus:Day is dawningWithout warningI step on something mushyCrap, I scream, this is like a bad dreamBut it’s so real and it’s gushy Hairballs, oh to live without hairballsI would be very happy, I would be very gladBut without my dear kitty I would be very sadSo, it’s hairballs in my pad" Enjoy your cat and enjoy #HairballAwarenessDay! And thank you, for reading and sharing!